Early this year, we have made it a routine to go to church with Warren every Sundays. Except for when we were out of the country, we’ve never missed this weekly ritual. After church, we’d go out for either breakfast, brunch or lunch. I’ve always loved breakfast food and so staples have been – Maple / Pancake House / McDo for breakfast good. Having known this, a good friend of mine recommended trying out this restaurant that served all day breakfast with a twist. Hence, after our Sunday church one Sunday, we drove to Fort in search of Early Bird Breakfast Club. We found it in the same complex as Fitness First and the old Pier One. 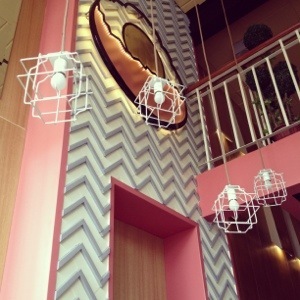 The place is rather small which gives it a rather homy ambiance. We had to wait for about 15mins to get seated but the staff were friendly and accommodating enough to make the wait bearable. All the things we ordered were nicely plated. This was hubby’s initial order meant to be an appetizer but this was SO heavy. I took one bite and that was filling enough for me. 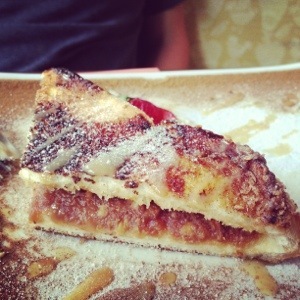 This is their version of a French toast – Peanut Butter and Caramel French Toast. 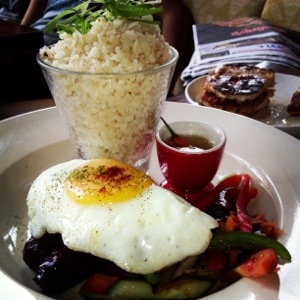 Viva Longganisa (Php345.00): 4 piece heirloom Longganisa with garlic rice and your choice of egg. 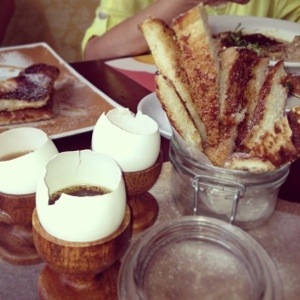 French Toast Fondue (Php210.00): Nice use of egg shells to put the variety of dips – maple syrup, cinnamon powder and chocolate. Mother in law ordered their arroz Caldo variation and liked it as well.